Helen and Elizabeth, two college gals, are spending a week with us, seeing what Benedictine monastic life is like here with our community. Their days are spent in ministries: both internal and outside of the monastery. Evenings are, generally, scheduled with groups of sisters for information and discussions on topics of spirituality and monasticism and anything else they may wish to ask about. Wednesday we had a special morning praise as it was the feast of Julian of Norwich, the 14th century hermit, who is quite popular today. Here is part of the Call to Worship our prayer leader recited, from a famous prayer by Julian: "I may make all things well, and I can make all things well, and I shall make all things well, and I will make all things well; and you will see for yourself that every kind of thing will be well." Our apple orchard is in bloom. Six deer passed through it yesterday---no doubt wondering when the fruit of these blossoms will be coming. Well, we can assure them that at least our annual salt lick will be arriving this weekend! 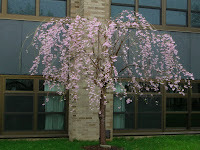 More delicately blossoming trees in the courtyard.